Constructing a home on a hard-to-reach island may seem expensive and difficult, but building in prefabricated parts can help make that secluded paradise a reality. Mid-century designer Jens Risom’s a-framed prefab summer retreat, located on the northern portion of Block Island, Rhode Island features an entire wall of windows that offers stunning views of the island. It took a mere six months—three in the factory and three on-site—for an asymmetrical prefab to come to fruition on the shore of Sweden’s Müsko Island. Prefab construction simplified the building process of a small summer home on Madeline Island in Wisconsin, where all materials had to be ferried across Lake Superior. A timber-clad prefab on Scotland’s Isle of Skye demonstrates a smart and local approach to building in far-flung locations. Prefab technology helped clear the logistical hurdles posed by a picturesque plot on British Columbia’s Gambier Island. The glass-and-wood-clad dream home is located on a steep slope draped in trees with a panoramic view of Howe Sound. A glass-encased prefab shed on a Finnish island provides a perfect summer getaway. 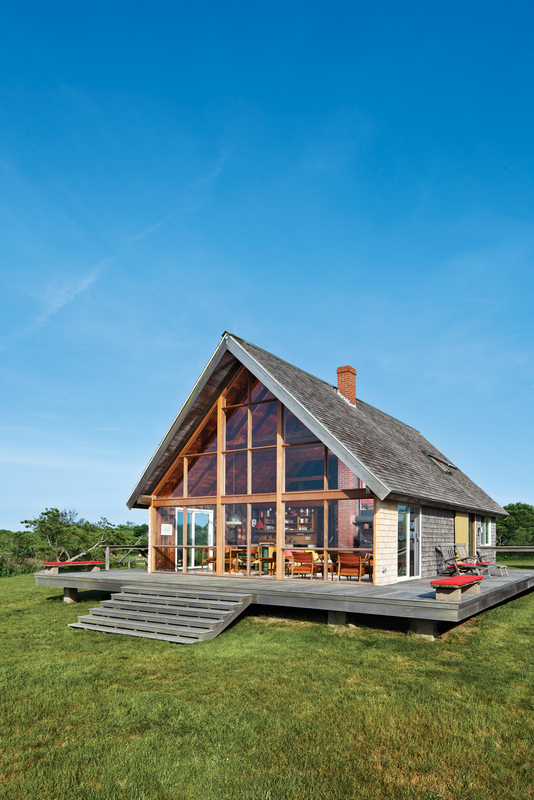 A remote retreat on New York’s Fishers Island becomes a more permanent home base, thanks to the efficiency of building modular.